Light years away from Earth, alien criminals called the Krites stage a space-break-out (mostly they just eat some guards) and escape from space-prison. Two bounty hunters are assigned to hunt down the little aliens and destroy them before the can multiply. The Krites land near a barn belonging to the Browns, a farm family that happens to have a bomb making drunk in their employ. The Krites proceed to eat all of their cows and Billy Zanes. The family is forced into a pitched battle against the ravenous monsters. The bounty hunters are in pursuit, but they may prove to be an even greater threat. To be perfectly fair, I saw Critters in the theater when I was twelve, which probably the perfect age to appreciate this movie. It’s noisy, gets pretty silly in spots and is occasionally gory (well, gory enough to warrant a PG-13, but this was the 1980s, so it’s still more violent than what you would get in a modern PG-13 movie). The comparisons to Gremlins (1984) are inescapable, but this was written sometime before Gremlins was released. In some ways it is the Gamera to Gremlins’ Godzilla: Basically the same subject, but going to further extremes in terms of comedy and violence. Upon a return viewing, I’m very surprised at how well it has aged. Sure, there's an awkward music video early on, and bounty hunter Ug’s disguise as rocker ‘Johnny Steele’ is about as dated looking as possible. There’s also an E.T. joke that didn’t need to be left in the final edit. The special effects are low budget, but they still well realized and don’t detract from the film at all. 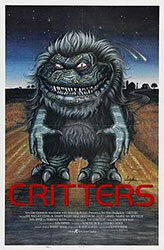 The Critters themselves are fun, and manage to communicate equal parts goofy and menacing. They are obviously puppets, but they have great detail and communicate quite a bit of character. It's helped immensely by the actors playing everything perfectly straight and doing everything they can to sell the Critters as a threat. The giant Krite late in the film is kept to the shadows which helps it from looking too much like a guy in a suit. One of Critters' biggest strengths is its pacing. After an intriguing opening, the movie spends just enough time with normality to make it have some impact when the monsters arrive and everything goes to hell. The actual attack on the farm house is great, there is a sense of real danger. The action keeps events ramping up gradually before turning frantic, and then calming down again only to have the appearance of the bounty hunters turn everything on its head. There is an ending scene that uses some reverse photography to rebuild the Brown’s farm house, it feels unnecessary and is possibly the most ludicrous thing in the whole movie, but since its little more than a coda, it’s easy to overlook. It can be dangerous to revisit childhood favorites, but Critters manages to hold its own against the ravages of time. In the world of little monster movies, Critters might not have the cultural cache of Gremlins, but it still manages to be an enjoyable adolescent horror film.